The following is taken from Martha Stewart's blog site. Your dog won’t realize it’s a visit from the vet! In-home acupuncture for your dog eliminates the stress of going to the vet while allowing Dr. Harrison to see your animal in its everyday environment. Because there is no temperature taking or blood draws involved in Dr. Harrison’s house call, your dog will be happy to see her when she rings the doorbell. Acupuncture in stress-free and comfortable surroundings is ideal for maximizing the benefits of Chinese medicine. Chinese herbal medicine is an important adjunct therapy to almost all acupuncture. What are the benefits of using Chinese herbs? What form do the herbs come in and will my dog eat them? Most herbal formulas are used for anywhere between 1 and 6 months. For an acute problem or injury, your animal may only need a short course of herbal medicine. For more chronic problems, herbal therapy may be extended. The Chinese herbs come in several different forms and the form that your animal is prescribed will depend on his/her temperament and appetite. Tea pills are tiny black balls that can be easily hidden in food. The capsule form is an option for more picky eaters and powder is generally reserved for larger dogs and all horses. Many of the more commonly-used herbal medications also come in concentrated forms to ease administration. While goats, camelids and other ruminants can be safely given herbal medication, their unique form of digestion requires a MUCH higher dosage of the herb—this is often cost-prohibitive or impractical. What will my dog experience during his acupuncture treatment? 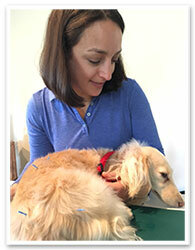 Acupuncture is essentially a pain-free process and most dogs tolerate needle placement well. Many dogs actively enjoy the process and may even fall asleep with the needles in. The needles used during treatment are tiny with some measuring just a few millimeters long. The number of needles placed per treatment varies depending on the age of the dog, the condition being treated, and the overall health and stability of the dog. Treatment length ranges from as short as 8 minutes to as long as 20 minutes and is tailored to your dog’s specific needs. An average routine acupuncture treatment takes about 30 minutes. However, during the initial appointment, please allow one hour as a detailed Chinese and Western medical history must obtained. At the beginning of every appointment, Dr. Harrison will perform a Chinese exam including tongue color/quality assessment, pulse evaluation and external body temperature review. 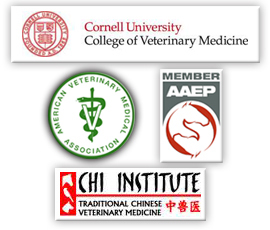 This exam will help Dr. Harrison reach a Chinese diagnosis as well as choose the most beneficial acupuncture points for your animal. When can I expect to see a difference in my dog? It is crucial to remember that acupuncture is a cumulative process and that a dog’s response to therapy is extremely variable. Your dog may have an immediate and dramatically positive response to treatment or he/she may show a more gradual, subtle response. In general, when being treated for an orthopedic condition—including arthritis, back/disc pain, hind-end weakness, and cruciate ligament tears—most dogs respond within 3-5 treatments spaced roughly 1 week apart. When treating internal medicine, skin, and behavior cases, a response is generally seen in 7-9 treatments. When is an herbal medication appropriate for my dog? There is almost always an appropriate herbal medication to accompany your dog’s acupuncture treatment. Although not required, herbal medication can enhance the effects of the acupuncture treatment and extend the amount of the time between acupuncture treatments. In most instances, any given herbal medication is taken for a relatively short period of time (1-3 months). After that time period, your dog may be “rested” from the prescribed herb for 1 month or switched to a different herb. The herbal formulas for dogs come in three different forms—powder, capsules and tea pills—and the form ordered depends on your dog’s size, appetite and willingness to be medicated. It is important to note that the herbal formulas prescribed by Dr. Harrison are not supplements. They are potent, prescription-only medications. Does Dr. Harrison treat cats or other domestic pets? Dr. Harrison has successfully treated numerous feline patients with acupuncture, although they often require professional restraint during the needling process. If your cat isn’t willing be safely needled, it may be a great candidate for “laserpuncture”. Laserpuncture involves stimulating the traditional Chinese acupuncture points with a highly focused cold laser beam for about 1 minute each. There are no needles involved, no discomfort felt and the laser is universally well-tolerated. What is Adequan and why is it the only Western medicine that Dr. Harrison uses? Adequan is the only FDA-approved treatment proven to reverse degenerative joint disease. Adequan is a safe and effective therapy and is the only Western medication that Dr. Harrison will start dogs on. Why? Adequan is an injectable therapy normally given at a single injection site in the muscle. Dr. Harrison uses Adequan for “aquapuncture” whereby she splits a normal dose into multiple smaller doses and injects them at several different acupuncture points. Not only does your dog get the therapeutic benefit of the Adequan, but also the benefit of the Adequan pushing on the acupuncture point, providing a prolonged stimulation. For dogs, there is an initial 1-month loading period during which the Adequan is administered twice weekly. After the loading period, the drug is given every 3-4 weeks and will be tailored to your dog’s acupuncture schedule. What does Adequan actually do?